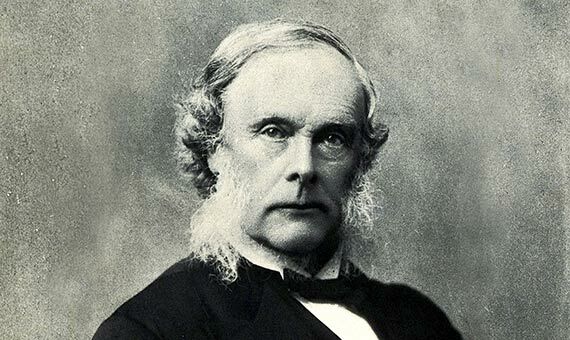 When surgeon Joseph Lister died at the age of 84 on February 10, 1912, he left behind a drastic reduction in the mortality of surgical patients due to infections. According to statistics collected by Lister himself, the decrease went from almost 50% of those operated on to only 15%. Although other pioneers were then working on the same ideas, and despite some experts having questioned Lister’s figures, there is no doubt that the British doctor has gone down in history as the father of antiseptic surgery. Nowadays, millions of people honour him every day without knowing it by rinsing their mouths with a mouthwash named in his honour, even though he did not participate in its invention nor benefit from it. Entering an operating room in 1865 was a life-or-death gamble. Anaesthesia had left behind the era of the agonizing screams of patients, but gangrene, septicaemia and other postoperative infections ended up affecting almost half of those operated on. The usual procedure to ward off infections was to ventilate the hospital wards in order to expel the miasmas, the “bad air” that doctors of this era believed were emitted by wounds and that spread the disease to other patients. 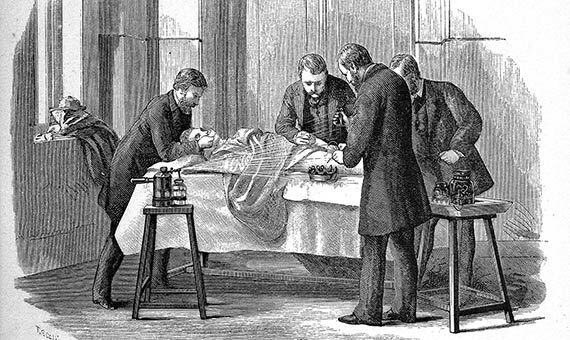 Beyond this almost unique hygienic habit, the surgeons of the time worshiped the “good old surgical stink,” as Lindsey Fitzharris reflects in her recent book The Butchering Art: Joseph Lister’s Quest to Transform the Grisly World of Victorian Medicine (Scientific American/Farrar, Straus and Giroux, 2017). The doctors arrived at the operating theatre in their street clothes and, without even washing their hands, put on their surgical gowns covered in dried blood and pus, like military stripes on an army uniform. During the operation, the surgeons used the gown eyelets to hang the suture threads and thus keep them at hand. The instruments, if any, were cleaned after the operation, but not before. If a scalpel fell to the ground, they picked it up and continued. If at any time it was necessary to use both hands, they gripped the scalpel with their teeth. In rural areas, it was not uncommon for the operation to be ended by applying a warm poultice of cow dung to the wound. In the recovery rooms, when the nurses made their rounds, the probe that was used to drain the pus from one patient’s infected wound might then be applied to the lesion of the patient in the next bed. Thus, it was not uncommon for even the surgeons themselves to resist operating as long as it was not absolutely essential. 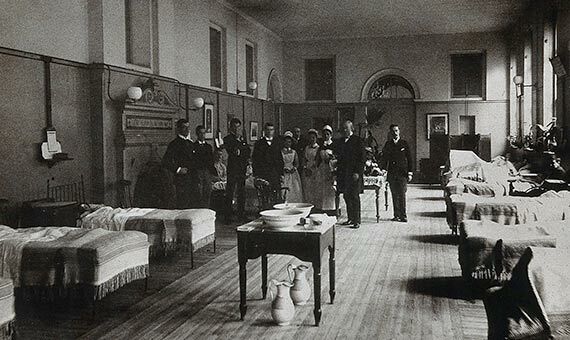 The problem of infections was so pressing that there was even talk of abolishing surgery altogether in hospitals. But Lister was not convinced by the theory of miasmas. He observed that the cleaning of the wound sometimes managed to contain the infection, leading him to suspect that the root of the problem was not in the air, but in the wound itself. In 1864, while practicing as a professor of surgery at the University of Glasgow, Lister discovered the work of a French chemist named Louis Pasteur. When he read in Recherches sur la putrefaction that fermentation was due to germs, microbes invisible to the eye, he sensed that the same cause could explain the infection of wounds. Following the ideas of Pasteur, Lister looked for a chemical substance with which to annihilate the germs. After several tests he arrived at carbolic acid (now called phenol), a compound extracted from creosote that was then used to prevent the rotting of railway sleepers and the wood of ships, and which was also applied to the wastewater of cities. In 1865, after some doubtful beginnings, he managed for the first time to heal without infection the open leg fracture of a child hit by a car. From then on, Lister laid out a protocol to sterilize the surgical instruments, the hands of the surgeon, the dressings and the wounds with solutions of carbolic acid, and even designed a sprayer to diffuse the substance in the air of the operating room, which was definitely not pleasant. But the results made up for the inconvenience, and in 1867 Lister was able to publish his findings and his antiseptic method in a series of articles in the magazine The Lancet. More than a century and a half later, however, methods and substances have changed. From our current perspective, we might be surprised by the generous use of the corrosive and toxic phenol, which nowadays is handled in laboratories with special care. But from Lister, today we have his revolutionary idea that drew the line between old-fashioned surgery and its modern incarnation. And we have Listerine.